Dennis Quaid stars in Vantage Point, directed by Pete Travis, as Thomas Barnes, a Secret Servive agent who must figure out who assassinated the American president (William Hurt) during a peace rally in Spain. The events from that assassination unfold from seven other perspectives including another Secret Service agent (Matthew Fox). The pieces of the mysterious puzzle becoming clearer with each perspective. Dennis Quiad has previously starred in a wide variety of films such as American Dreamz, Yours, Mine & Ours, In Good Company, The Day After Tomorrow, Far From Heaven, The Rookie, Any Given Sunday, Wyatt Earp, Everybody's All American, and Breaking Away. He will soon be seen in Smart People, which premiered at Sundance. I had the privilege to interview him. 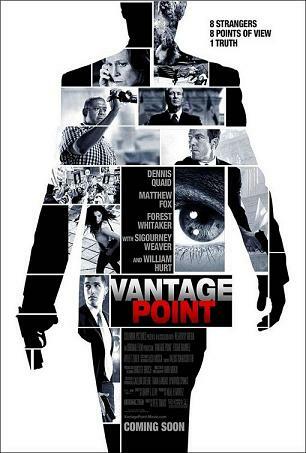 Columbia Pictures releases Vantage Point on February 22nd, 2008. NYC MOVIE GURU: What attracted you to star in Vantage Point? DQ: It told the story through the action instead of a lot of exposition. It’s an exciting story told in an interesting way. NYC MOVIE GURU: Did you extrapolate more background information about you’re the character, Thomas Barnes? DQ: I come up with a biography for pretty much every character that I [play]. It’s something that the audience doesn’t have to know, but it’s something that’s easier for myself. Pete [Travis] and I came up with the idea to put in that scene in the hotel room where it’s his first day back on the job and he’s, sort of, doubting himself. It informed the character for the audience and that’s all you needed to know. NYC MOVIE GURU: How did you manage to have a clear-cut understanding of the intricate plot? DQ: That was really Pete [Travis]’s job and because he did it so well, he made it easy for everyone else. We would shoot one point-of-view for about 4 or 5 days and then another’s character for 4 or 5 days, even though it might have been more efficient to skip around since you were already there. It made it a little clearer for everyone to know who’s story we were [shooting] and to do that all the way through. NYC MOVIE GURU: Was the atmosphere on set different from the atmosphere on the sets of non-action films? DQ: No, not really. It all depends, really, on the director of the film. He’s really the hub of what creates an atmosphere on a movie. The mood on [this] set reminded me of the old days when everybody hung out with every one. We all on the set all day and together in the hotel at night because you can’t actually go out and walk in Mexico City. NYC MOVIE GURU: Did you acting change throughout each point-of-view? DQ: I played it pretty much all the same all the way through without changing anything. I think it’s because the audience is informed through another character’s point-of-view and know more pieces of the puzzle, it makes them wonder what’s going on, so they see things in a different way. NYC MOVIE GURU: How much of the car chase sequence were you really driving behind the wheel? DQ: 99% of it is me, actually. The parts when [the cars] bang into each other, they left that to someone else. I love to drive and have so few lines of dialogue in Vantage Point, so I really had to do something. During the chase it where that would happen, so I wanted to do that as much as I could. NYC MOVIE GURU: How safe did you feel during the car chase? DQ: It’s not as dangerous as it looks. There’s always a margin of safety. I worked on it on a long time with the stunt guys. We’d go out on parking lots and set up cardboard boxes and I’d come up to it going 60 MPH and hit the [emergency] breaks and see how I close I could come and controlling it without rubbing up against it. NYC MOVIE GURU: Would you like to become a Secret Service agent? DQ: I don’t think they would have me because I don’t have the pass credentials to get in there. What those guys do is amazing. They make themselves larger while everybody else makes themselves smaller, hitting the floor when the guns go off. I really don’t see myself taking a bullet for anybody except for my kids. They’re amazing people. I don’t know if I’d really want to be a Secret Service agent. In the movie, it’s exciting and romantic and everything, but most of their job is really standing in a hallway for 12 hours making sure somebody doesn’t come through a doorway off of a stairwell. I guess I could relate to that because the most boring part of my job is waiting for [the crew] to set-up. NYC MOVIE GURU: What other professions have you considered exploring in life? DQ: I always wanted to be an astronaut. I actually got my pilot’s license from that. I could probably still go out and start flying for an FBO somewhere. I love [playing a] baseball player, but that ends when you’re in your thirties. I love being an actor because you can do it until you die. There’s always something different going along. NYC MOVIE GURU: How do you find the time to spend with your family? DQ: Family is the most important thing in life. Period. That’s the way it is, that’s the way it goes. With my first child, Jack, I was very aware of spending time with him. I was fortunate enough to do that throughout his growing-up. He’s 16 now, so it’s more important to spend time with him now. He has a good head on his shoulders and is doing really well. With the 2 [kids] that have just come along at this point, I have a stay-at-home mom. They’re very portable, at least for the next 5 years until they hit school. NYC MOVIE GURU: How have you managed to keep on working as an actor for so many years? DQ: A large part has to do with tenacity, [just] hanging in there and, when you do lose the fire for what you’re doing, [then] find some way to get it back. At this point in my career, I’m feeling that I’m really having a better time than when I started out.